A special thank you to Linking Families & Communities—the very first recipient of our Child Care Solutions Fund grant—for writing this Grant Partner blog. To learn more about this organization and how they are helping women and families in north central Iowa, visit https://www.linking-families.com/. In order for children to grow up to be happy, healthy, and productive adults, they need to have safe, positive, healthy childhoods. Linking Families and Communities works to that end by focusing on young children, pre-birth to age 5 and their families. The nonprofit organization serves as the Early Childhood Iowa area for Calhoun, Pocahontas, and Webster County in north central Iowa. In collaboration with other community agencies, Linking Families and Communities addresses access to resources, family support, mental health, and child care issues, building local systems that meet the needs of young children and their families in order to give all children a great start. The passage and implementation of the Child Care Development Block Grant Act of 2014 had a large impact on an already declining child care supply in the Linking Families and Communities area. Parents struggled to find and keep child care, and businesses began to experience difficulty with recruitment, retention, and productivity of their workforce due to child care issues, especially in Fort Dodge, the regional hub of the area. Linking Families and Communities, along with eight other businesses and organizations, formed a workgroup on the issue and collaboratively funded a market analysis and feasibility study for the community of Fort Dodge. The study revealed the need for 1,638 child care spaces. With the need for so many spaces, there was not one solution—the community needed many solutions. As an organization, Linking Families and Communities had implemented an incentive program to recruit new child care providers, but center expansion and recruitment was also needed. With a vision to expand existing centers and potentially build a new center, Linking Families and Communities sought additional opportunities to begin the process. As a result of being the first recipient of the Iowa Women’s Foundation’s Child Care Solutions Fund grant, Linking Families and Communities was able to take another step toward reversing the declining child care trend. 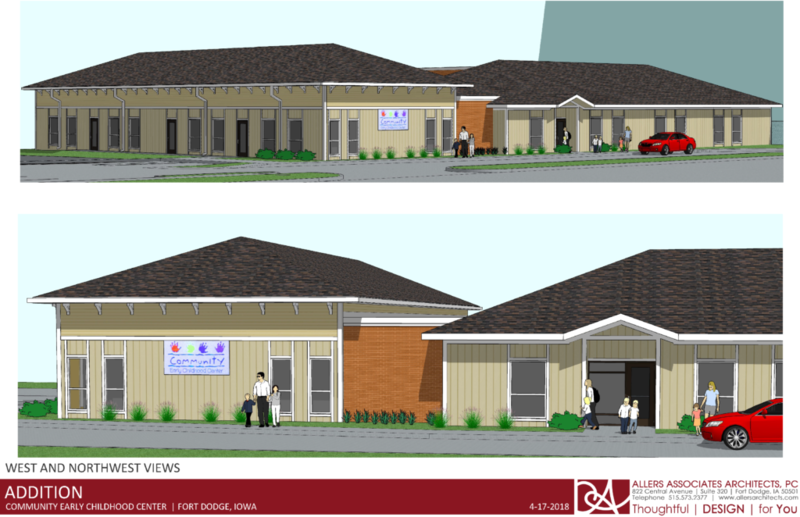 Grant funds were used to contract with Allers Associates Architects, PC to complete pre-design work for an expansion of Community Early Childhood Center, as well as build a new center. With the designs complete for both projects, planning is underway to identify and secure funds to bring both projects to fruition, which will add 205 child care spaces.